Last week I talked about Creative Frustration. This week, however, I've seen unleashed "Creative Energy" in action! My son, Tony, published his first ebook on Smashwords.com. Titled, Viper Girl vs. 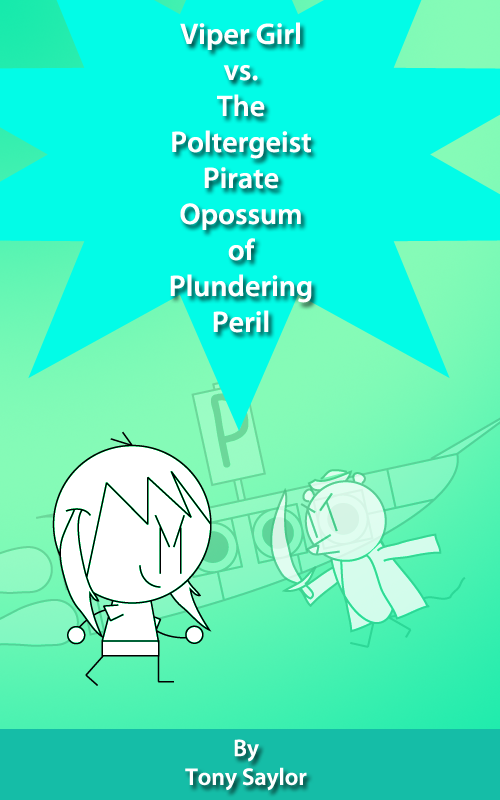 The Poltergeist Pirate Opossum of Plundering Peril, it is the first in a series of humorous action/adventure children's books starring Viper Girl. 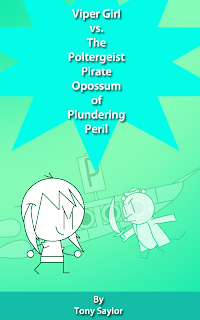 The ebook is currently on sale in several formats (they cover all types of readers, computers, electronic devices) for ninety-nine cents. If we did the formatting correctly for the Smashwords "meatgrinder" conversion (that's where I put all my energy -- not very creative -- this week), hopefully you will see the book for sale at other online book vendors, like Barnes & Noble and Amazon, after a couple of weeks. After weeks of working on the story, editing, re-writing, and struggling with how he wanted the art to look, he finished the book on Monday! It was amazing to watch the energy and focus that he put into this project. Tony is on the high-functioning end of the autism spectrum and while he often has trouble with focus and attention, if it is something that he is interested in and passionate about -- watch out!! He puts his all into it. That's what he did with this project and he is already working on the sequel and figuring out ways to upgrade the art. 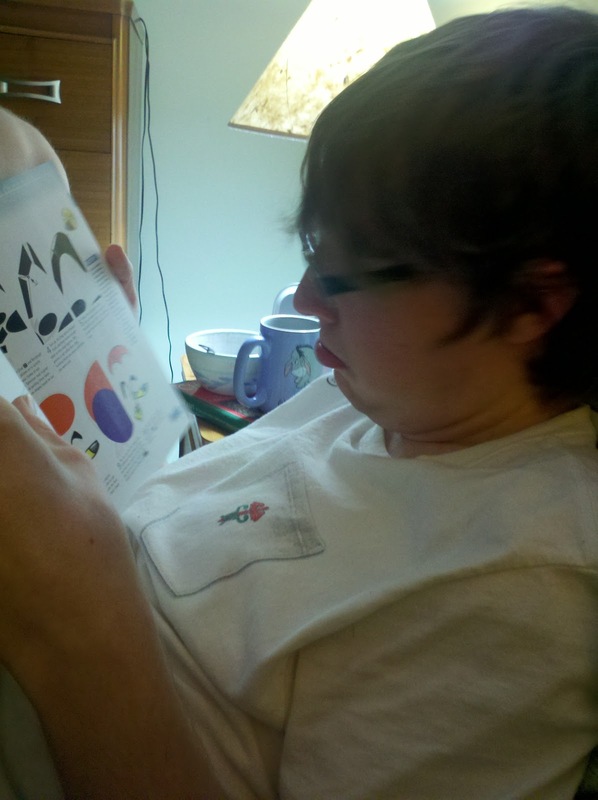 Here's a photo I took of him last night as he was studying possible ways to use shape tools in Adobe Flash to improve the art style. At one point, Tony was convinced he wanted a career in video game design. After pursuing a degree in that field for almost two years and talking with people in the field, he realized it was not for him. I give him a lot of credit for having such insight at his age. Now he is at Eastern Michigan University, pursuing an interdisciplinary major in Children's Literature and Theatre for the Young, and he is so much more absorbed by what he is doing and studying. (Of course it helps that they also have a great supports program for students with autism at EMU.) I think he found his niche, because the change in his level of involvement, and creative thinking, and excitement about what he wants to do has been palpable. He doesn't have it all figured out yet (does anyone ever? ), but he is passionate about finding his path and making it work. Tony has always been a "story person" -- imagining stories, acting things out in his mind, drawing characters and comics endlessly. 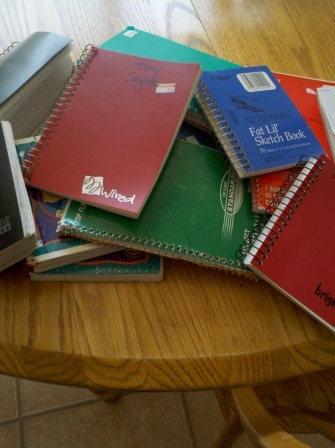 In fact, when he was young he had a notebook and pencil with him at all times. I have drawers and shelves full of old notebooks containing his drawings. (I couldn't throw them away -- it is an amazing collection). This is only a small sample from one drawer. Lately, Tony has started carrying a small notebook with him again. It is good to know that he is once again ready to capture all that creative energy. My son, Tony, recently had a reading assignment for one of his classes wherein the author used the term "creative despair" to describe that emotional place an artist sometimes gets trapped in where they simply feel like they can't move forward with a project. They feel like they've hit a wall, and no matter what they try, they can't get around it. Frustrations mount, they feel annoyed and depressed, they "despair" that they will ever be able to create what is stuck in their head. I think Tony mentioned this term from his reading to me because it is something that he has experienced himself when working on his comic strip, or in working on the new e-book for kids that he is hoping to publish soon. He thought the author had really captured the feeling with the phrase "creative despair". I would not quite say that I experienced creative despair this week -- more like "I just want to get my hands on my project and I just can't seem to get back to it" frustration. It wasn't that I didn't know how to proceed with my projects or experienced a creative block; it was more that life just kept throwing obstacles in my path that kept me from being able to reach out and lay my hands on my work. The feeling I experienced is much like that one has in the familiar dream where there is something you must do and no matter how hard you try you cannot get it accomplished --something keeps getting in the way. It's that feeling like "Oh, if I just get this one more thing done, I can get to it", but then you find its an illusion, because "one more thing" keeps popping into your path ... again and again and again. Good old-fashioned "frustration" -- that's probably the best word for it. Given the state of my week, I thought I could at least get my blog post up on time this week -- I try for every Friday. But no, again, things came up that I needed to deal with "right away" straight through the early evening. At 9 pm, I found myself with time to write, but no energy and no idea of what to say. So, I'm writing this (Saturday) morning. At least, I'm getting something accomplished. I thought that this morning I would just share photos of the two projects I've been trying to work on this week. They are very different projects. One is a bridal necklace -- the design is still taking shape in my mind. I created some flowers using a white tulle remnant that I found in a fabric store and some faceted crystal beads. The tulle caught my eye because there is a droplet effect scattered over the tulle, as though drops of dew have been sprinkled over it. These photos show some of the elements I've picked out for the necklace, as well as a samples of the flowers I've made. Some were taken in the evening, in artificial light, and some were taken this morning in natural light. It gives you any idea of the difference in the way the white and the beads reflect in different light schemes. The second project that I am working on is a lacy scarf . I LOVE the yarn -- it is very delicate, very soft and has a shimmering halo effect around the strand. It's called Luna, and the name fits it well. The photos below just don't it justice. Topaz glass seed beads are being added to some of the stitches to provide a bit more sparkle and catch the light. The one other thing that I did accomplish this week that was at least related to my creative pursuits was to change my blog format. I'd love to hear your thoughts on the new look.